Watching Edward Scissorhands back with as unprejudiced an eye as possible, it’s hard to deny that Depp is very, very good in the role. 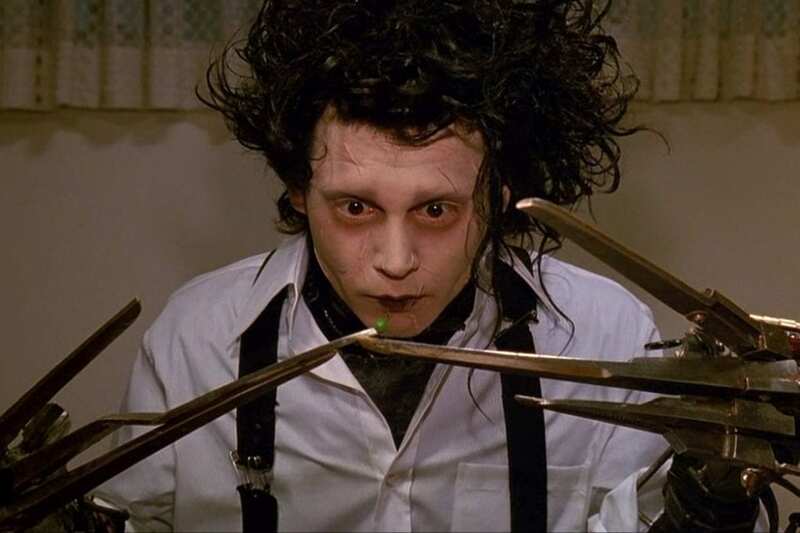 A virtually mute robot with blades for fingers – originally conceived by Burton as an avatar for his own adolescent loneliness – Scissorhands is the kind of character who could easily come off as either creepy or ludicrous. But Depp’s physicality injects a palpable vulnerability that allows you to believe that the people he encounters would feel natural empathy towards him. The movie was also an important moment for Burton – having made his name with Beetlejuice and established his box office credentials by successfully helming the 1989 Batman movie, the director was in the enviable position in which he could have chosen practically anything he wanted for his next project. Yet rather than jumping into another blockbuster, he chose to make the film he has since described as the most personal of his career. Like most of Burton’s films, there’s more idea than solidly structured story to Edward Scissorhands – the film is a visual and musical delight with an excellent central performance and a uniformly appealing supporting cast, including Dianne Wiest as the warm hearted matriarch who takes Edward in, and Winona Ryder adopting a magnificent wig and an endearingly shonky old lady voice as the obligatory love interest. But it’s fair to say that the melodramatic final act jars a little in comparison to the whimsical first half, and the ending ultimately feels a little rushed. Still, if Edward Scissorhands is ultimately a bit more style than substance, it’s still one of the most striking and enjoyably odd hit movies of the era, and a timely reminder of the talents of an actor and director who’ve both gone slightly off the boil in recent years. As we ease into our festive mini-season for December, friend of the show Paul Hawkins from Blokebusters joins us to wax nostalgic and to help pitch some potential sequel ideas that might just restore Depp and Burton’s credibility… or possibly hammer the final nail into their careers. Either way, it’s a win-win for the rest of us. You can download or stream our Edward Scissorhands episode right now using the links at the top of this blog post – or by searching Beyond The Box Set on your preferred podcasting platform. Ratings, reviews and recommendations are all excellent ways of helping us to get the show out there, and if you’d like to contact us directly you can leave a comment beneath this blog or find us on Facebook, Twitter and Instagram. If you really love the show, you can also become a VIP listener on Patreon to access our weekly bonus show Beyond BTBS in addition to a range of additional incentives including a regular promo slot, the chance to select a movie for us to cover on a future episode and access to our secret online fan club. Next week, we’re kicking our festive mini-season into high gear with an unquestionable modern Christmas classic. Until then happy listening, and remember – waterbeds aren’t just easily punctured, they’re also terrible for your back.